Located in the heart of Virginia’s Blue Ridge Mountains, Carroll County offers an array of activities, scenery and has deeply rooted Appalachian culture. Our county borders North Carolina and uniquely has diverse geography featuring breath-taking mountain top views as well as scenic foothills and Piedmont vistas. The County seat is located in the Town of Hillsville, our population is 29,000 over 478 square miles. We experience all four seasons with peak travel time being in the months of June – July and again in October. 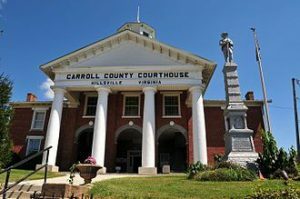 The Carroll County Governmental Complex is located on 605 Pine Street in Hillsville, Virginia. 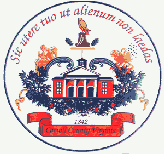 Carroll County utilizes the County Board Form of Government, adopted in 1971 and authorized by Section 15.2 of the Code of Virginia. Carroll County’s Government System comprises of 6 Board of Supervisors from 5Magistrial Districts within the county with one Supervisor-at-Large. The County Administrator is appointed by the Board of Supervisors. All County Departments report directly to the Assistant County Administrator under the direction of the County Administrator with the exception of the Constitutional offices. Constitutional Officers are elected by the people in general elections. R. J. “Bob” Martin, Jr.